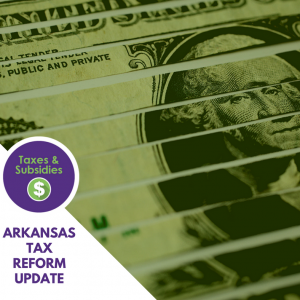 Tax reform is moving right along in the Arkansas Legislature. ACRE Scholar and UCA Assistant Professor of Economics Jeremy Horpedahl has been busy helping Arkansans understand what the possible changes could mean for them. Jeremy Horpedahl discussed the latest news on Arkansas’s taxes with Jessi Tunure on KARK 4 News’s Capitol View. They cover where the $97 million for the tax cuts will come from, how this cut relates to previous cuts, how it will affect our competitiveness with neighboring states, internet sales taxes, corporate tax changes, gas taxes, highway funding and more. Horpedahl’s segment begins around 9:05. Having trouble keeping up with the twists and turns in Arkansas Tax Reform? Our latest blog post, “Implementing Phase 3 of the Individual Income Tax Cuts in Arkansas” co authored by Jeremy Horpedahl and Nicole Kaeding, Director of Federal Projects at the Tax Foundation, covers where we are and how far we’ve come. This blog post is cross posted on the Tax Foundation blog. “The $97 million revenue cost is also similar to that of the 2015 tax cut targeted at middle-income taxpayers. And the reduction of the top rate from 6.9 percent to 5.9 percent makes Arkansas more competitive among its neighbors and in the South generally. Currently, the 6.9 percent rate is the highest among Arkansas’s neighboring states, and the second highest in the South (just below South Carolina’s 7.0 percent). This reduction brings Arkansas roughly in line with neighboring Missouri (5.9 percent) and Louisiana (6.0 percent), as well as Georgia and Kentucky (both at 6.0 percent). “As news of the 5.9 plan filtered down to legislators and policymakers, initial impressions were mostly positive of one of the top priorities of the governor’s legislative agenda. Jeremy Horpedahl, a University of Central Arkansas economist, called the proposal a ‘big step’ towards a more competitive tax environment in Arkansas. Jeremy Horpedahl was a guest on the Dave Elswick Show being recorded live from the Capitol. They discuss the newest proposed income tax cut in Arkansas. You can listen to the January 31st show online. Horpedahl’s segment begins at 1.02.14.